Given the number of wine styles around the world to try, it only makes sense that there would be nearly as many wine bottle opener styles to grant you access to the liquids within. We've the best rabbit wine opener to help you get tasting. The BANG HUI Rabbit Wine Opener retains lever-style advantages, but also improve the shortcomings. Through shape design, increase sturdy stand ensures that the rabbit corkscrew and bonus foil cutter are stowed neatly together. A visually pleasing design to enhance the decor of your home. 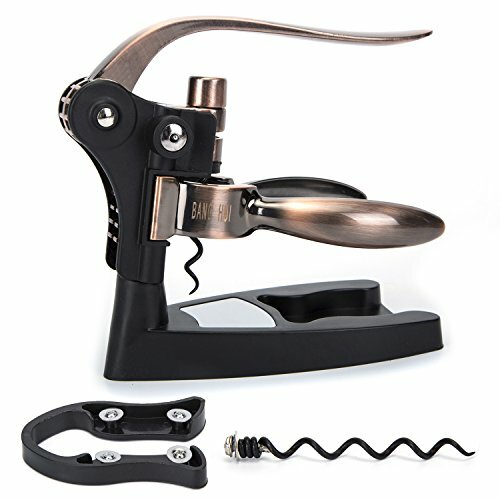 How to use wine opener? Grip the bottle neck firmly with the grip handles, slowly bring the lever up and return to closed position, the screw has been driven fully into the cork and is ready to pull the cork. Keep a firm grip on the bottle neck with the handles and slowly lift the lever back to the open position. Firstly bring the lever back to closed position. Grasp the cork with the handles and swing the lever into the open position. Catch the cork which falls from black screw in the palm of your hands. Our wine bottle opener is quality-made with durable metal parts, so you won't be replacing it anytime soon. It's a sleek and stylish addition to any bar or kitchen, whether you're an avid oenophile or just like a nice glass of Pinot with dinner! Comes beautifully presented in a lined box. A classy gift for the business executive, Christmas, Hanukah, Father's & Mother's Day, or a birthday, bridal shower, bachelor party & more! Get 1 for a friend and another for yourself!Click "Add to Cart" to buy now! NOTE:Please DO NOT BUY this item from Other Sellers that following to BANG HUI's,they are the FRAUDS.You will lose your money if you buy items from them.Make Your Life Simple,Bronz Rabbit Wine Opener,SIMPLE and CLASSIC.Open a bottle of wine with BANG HUI's classic rabbit wine opener,enjoy the experience of using a manual bottle opener. Great Partner For Wine Lovers.If you are a wine lover,you must have one for opening every bottle of wine.Of course,you can give your friends their own corkscrew set(includes foil cutter,wine opener and extra screw pull and comes in a elegant fashionable gift box. Structure: wine opener Design based on classic lever and grip, the legendary smooth lever action is based on the idea of mechanical advantage. As pressure is applied at one end of the lever handle, power is multiplied at the corkscrew, making it easier to open the bottle with one fluid motion Apply In Family,Party,Restaurant and Bar.The first and best choice for opening a bottle of wine elegantly. Perfect Gifts For Business Communication.The corkscrew is made from Zinc alloy high quality and durable material with a beautiful look,it can help you for your work sometime. If you have any questions about this product by BANG HUI, contact us by completing and submitting the form below. If you are looking for a specif part number, please include it with your message.